This is a coherent and integrated set of essays around the theme of governance addressing a wide range of questions on the organisation and legitimation of authority. At the heart of the book is a set of topics which have long attracted the attention of urbanists and urban historians all over the world: the growth and reform of urban local government, local-centre relationships, public health and pollution, local government finance, the nature of local social élites and of participation in local government. 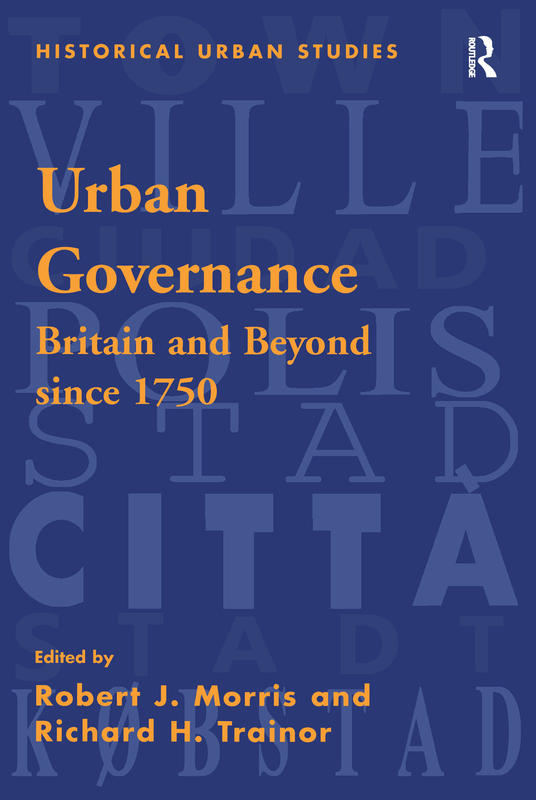 Approaching these topics through the concept of governance not only raises a series of new questions but also extends the scope of enquiry for the historian seeking to understand towns and cities all over the world in a period of rapid change. Questions of governance must be central to a variety of enquiries into the nature of the urban place. There are questions about the setting of agendas, about when a localised or neighbourhood issue becomes a big city or even national political issue, about what makes a ’problem’. Public health and related matters form a central part of the ’issues’ especially for the British; in North America fire and the development of urban real estate have dominated; in India the security of the colonial government had a prominent place. The historical dynamic of these essays follows the change from the chartered governments of the seventeenth and eighteenth centuries towards the representative regimes of the nineteenth and twentieth. However, such historical change is not regarded as inevitable, and the effects of bureaucratic growth, regulatory regimes, the legitimating role of rational and scientific knowledge as well as the innovatory use of ritual and space are all dealt with at length. Contents: Preface, Richard H. Trainor and Robert J. Morris; Governance: Two centuries of urban growth, Robert J. Morris; Urban Governance: some reflections, Mike Goldsmith and John Garrard; The ’decline’ of British urban governance since 1850: a reassessment, Richard H. Trainor; Urban government, finance and public health in Victorian Britain, Robert Millward; The role and influence of Glasgow’s municipal managers 1890s-1930s, Irene Maver; Urban governance in Montreal and Toronto in a period of transition, Michèle Dagenais; A spirit of improvement: improvement commissioners, boards of health and central-local relations in Portsea, Ann Day; Expediency, authority and duplicity: reforming Sheffield’s police, 1832-40, Chris Williams; Politics, ideology and the governance of health care in Sheffield before the NHS, Tim Willis; French local authorities and the challenge of industrial pollution, c. 1810-1917, Geneviève Massard-Guilbaud; A paradigm of inaction? The politics and un-politics of smoke abatement legislation in Stockport 1844-56, Jean Adams; Industrial conciliation, class co-operation and the urban landscape in mid-Victorian England, Donna Loftus; The search for legitimacy: universities, medical licensing bodies and governance in Glasgow and Edinburgh from the late eighteenth to the late nineteenth centuries, Campbell F. Lloyd; Ownership of the place of burial: a study of early nineteenth-century urban conflict in Britain, Julie Rugg; Ritual and civic culture in the English industrial city, c. 1835-1914, Simon Gunn; The management of urban public spaces: Shahjahanabad, New Delhi, Greater Delhi, 1857-1997, Narayani Gupta; Index.